The foursome of Lionel S. Michelman, Samuel M. Michelman, David L. Michelman, and Milton Michelman were credited as inventors on a series of patents issued in the 1970s. The patents were for a tamper-proof locking device. See, for instance, patent 4031722, filed 7 June 1976 and issued 28 June 1977, in google patents. The original assignee on each of these patents was the Michelman Iron Works Corporation. 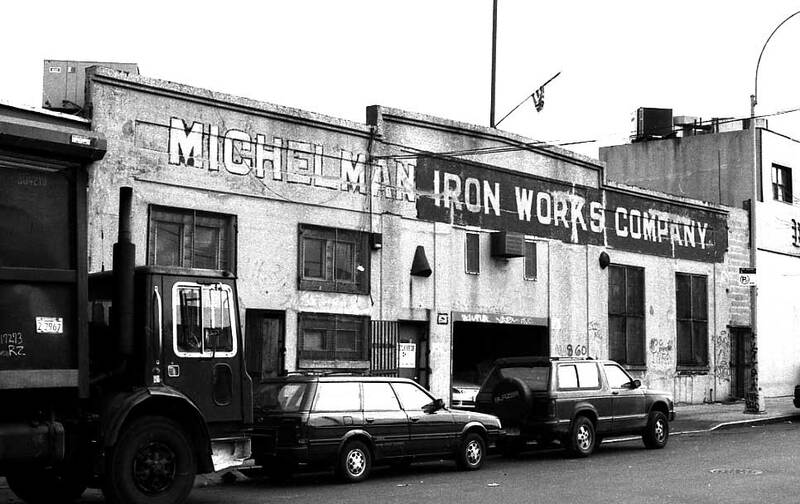 Michelman Iron Works Company was formed in 1946 and operated independently in Brooklyn until the 1990s. Their first listing in the Brooklyn telephone directory was in 1947, when they were located at 50 Boerum St. They moved to 860 Humboldt St. in 1962. In the 1990s they formed a partnership with Bethlehem Contracting Co. in Bath, Pennsylvania, and these two companies officially merged in 2002 to form the Michelman-Cancelliere Iron Works. Some of this history can be found at www.jcjones.com. This mentions that Michelman Iron Works "was firmly entrenched in the bridge rehabilitation business with the New York City Transit Authority." The founders of Michelman Iron Works were the brothers, Milton Michelman (1906-1990) and David L. Michelman (1908-2002). The brothers were the sons of Chaim Michelman (1871-1948). According to information on family trees at ancestry.com Milton Michelman was born 25 Nov. 1906, Vilnius, Lithuania, and died 19 Jan. 1990, Long Beach, N. Y. David Michelman was born 18 June 1906, Ponar, Lithuania, and died 17 Feb. 2002, Queens, N. Y. The Michelman family was recorded in the 1925 New York State Census living at 605 Snediker Ave., Brooklyn. Hyman (Chaim) Michelman was 53 years old, a carpenter, Milton Michelman was 19, a plumber, and David was 17, a draftsman. In the 1930 U. S. Census Chaim Michelman owned a poultry farm in Jackson, Ocean County, New Jersey. Among other family members was his grandson, Samuel M. Michelman, age 6. Samuel M. Michelman (1924-1994) was the son of Harry Philip Michelman (a brother of Milton and David L. Michelman) and the nephew of the founders of Michelman Iron Works. He was employed at the iron works in its early days. Also found in the 1930 U. S. Census was David Michelman, age 24, working as a "draftsman iron works." Milton Michelman applied for citizenship in 1932, when he stated that he was an iron worker, that he was born in Vilnius, Poland, 25 Nov. 1906, and that he emigrated from Cherbourg, France, and arrived in New York 3 July 1921 on the vessel Berengaria. He married his wife, Sally, 30 Sept. 1930, in Brooklyn, N. Y. The 1940 U. S. Census recorded Milton, David and Samuel Michelman. David was 31, a draftsman, living at 333 Neptune Ave., Brooklyn. Milton was 33, a "finisher, iron works," living at 686 Hendrix St., Brooklyn. Samuel was 16, the son of Harry Michelman, living at 2096 Coney Island Ave., Brooklyn. Lionel S. Michelman, born 4 Oct. 1940, was listed as a corporate officer at the Michelman-Cancelliere Iron Works in 2011.